On this week's brand new edition of the show, we're going to celebrate the birthdays of Michael H. Cleary and Lorenz Hart, celebrate International Jazz Day and the month of May, and we'll do some gardening. 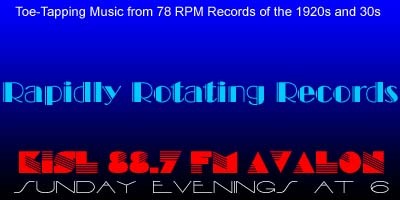 Once again, a number of records on this edition of the show are making their RRR debut. As always, just click on the link below to listen streaming online and/or download the show. Your comments, requests and topic suggestions are always welcome. What is your favorite record on this week's show?? H'lo Baby – Fred Waring and His Pennsylvanians / Will Morgan, v.
Here It Is Monday And I've Still Got A Dollar – Chick Bullock's Levee Loungers / Chick Bullock, v.
A Jazz Holiday – Ted Lewis and His Band / Ted Lewis, v.
A Night In May – Bob Haring AHO / Oliver Smith (Frank Munn), v.
One Morning In May – Roy Fox and His Band / Denny Dennis, v.
Ten Cents A Dance – The High Hatters / Welcome Lewis, v.
Lover – Debroy Somers and His Band / Dan Donovan, v.
Any Old Place With You – Buddy Blue and His Texans (Smith Ballew) / Smith Ballew, v.